The Night Of is a hard look at the judicial system, The New York Police Department, Rikers Island Penitentiary and racism in the United States. I remember when we first got cable TV in my house and HBO was THE movie channel (yes I know, I'm dating myself). Then, HBO started creating original series and have been doing a great job of it for over 15 years (Game of Thrones, anyone?). Now, they are creating a block of what I would describe as mini-series - first with American Crime Story: The People vs. OJ Simpson and, most recently, with The Night of. The latter is a gripping eight–part show chronicling the events of October 24th when a gruesome murder occurs and a young man's life is altered forever. Nasir Kahn (Riz Ahmed; Jason Bourne) is a college student who tutors Basketball players on the side. He is the nerd to their "star power". When they invite him to a party one night he wants to go and when his ride backs out he "borrows" his father's taxi to get to Manhattan. Unfortunately, he can't figure out how to turn on the "off Duty" light and ends up with a beautiful young woman in his cab. He decides to drive her around and eventually sleeps with her only to wake up a few hours later to find her dead in bed - stabbed to death. Nasir panics, takes what is presumed to be the murder weapon and flees the scene only to be picked up blocks later by the police on a reckless driving charge. Eventually linking Nasir to the crime, they arrest him and set off a chain reaction that ends with a life and family basically ruined and some professionals questioning their careers and choices. The Night Of is a hard look at the judicial system, The New York Police Department, Rikers Island Penitentiary and racism in the United States. It portrays the police as lazy individuals who want to wrap up a case as quickly and neatly as possible. It also gives the average citizen an inside look at New York Correctional facilities and the flawed "class" system at work inside the jails that can take a young man from an innocent, and somewhat naïve, college student to a hard, drug addicted criminal. The gem of the series is the superb cast. Besides Ahmed, who does a great job convincing us of his vulnerability that isn't completely real, the star of the show is John Tuturro (O Brother, Where Art Thou?) as John Stone, the "ambulance chasing" attorney who happens to be at the right place at the right time. As a somewhat skittish, almost neurotic lawyer, he gives us a jaded look at the system and how the "game" is played. Honorable mention also goes to Bill Camp (Jason Bourne) as NYPD detective Box, Jeannie Berlin (Café Society) as the Assistant Attorney general trying the case, and Amara Karan (Stan Lee's Lucky Man) as the lawyer who becomes Kahn's attorney. The cast plays well off each other and seems to form a cohesive unit, even when they are at odds with each other. The series has a slow start that picks up a little in episode two and then gains momentum in episode three only to peter out again by the finale. It doesn't hold back though in terms of content and graphic scenes. From the murder scene to the prison drug use, nothing is really left to the imagination. This type of production value is part of what makes the show so great. The Blu-ray is presented in 1080p high definition video with an aspect ratio of 1.78:1 and while the scenes are purposely gritty and dirty to portray New York City, the police station and jail in a certain light, the quality is excellent. The audio is the standard DTS-HD Master audio 5.1, which is mixed well for clear dialog and soundtrack. The audio even has some surround sound moments, which is great for viewing in a home theater setting. Despite the slow spots, the series is solid, good television that is interesting and entertaining as the same time. Tuturro reminds us why he is a terrific actor who can usually always find work in the industry and Ahmed gives a display of a range of emotions that is relevant. Couple these two fine actors with a great supporting cast and a strong script and there was no way The Night of could have missed. 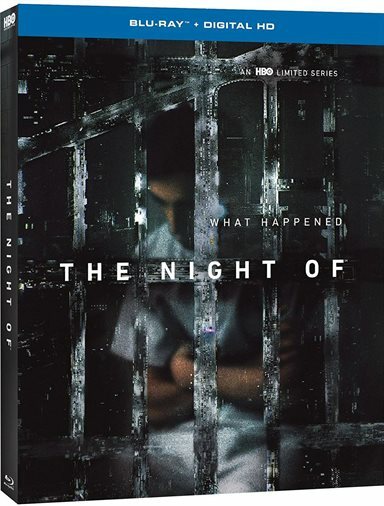 Download The Night Of from the iTunes Store in Digial HD. For more information about The Night Of visit the FlickDirect Movie Database.